Jack Shaw pictured after his last fight in Cardiff Bay. Pic: Dolly Clew. Welshman Jack Shore comes across as a cage fighter with nerves of steel, strong belief in his ability to win the World title and high intelligence. He is unbeaten in nine professional fights and aims for World glory when he takes on London’s Mike Ekundayo at the Viola Arena in Cardiff Bay this Saturday. Shore, who has university degrees in psychology and criminology, has spent the last three years working full-time to earn his tilt at the World bantamweight crown. “My goal is to win the World title at the Viola Arena on Saturday and then I will have three more fights left on my contract,” says Shore, a man who knows what he wants and will do anything within the rules to achievement his ambitions. “I can’t look beyond my contract just yet, but if I was still unbeaten at that stage I would be looking to progress to the premier organisation in mixed martial arts – Ultimate Fighting Championship. This Saturday, Europe’s leading MMA promotion will stage their biggest event of all time at the Viola Arena in Cardiff, topped by that bantamweight World title fight between unbeaten super-prospects Shore and Ekundayo. Over the last 16 years there have been 99 events over three continents – and almost 100 fighters have progressed to the UFC including some of the sports biggest names like Conor McGregor, Michael Bisping, Dan Hardy, Joanna Jedrzejczyk. Now it’s time for Cage Warriors to make history with the mammoth CW100 – their most impressive card to date. Jack Shore picture before face-off at a Cardiff Devils match. Pic: Helen Brabon. Shore, Abertillery born and bred, will have the packed-out Viola Arena behind him, but Ekundayo has promised to deliver an unforgettable performance to steal the away win. It’s one of the most closely contested fights in the promotion’s history. Only one man can be crowned champion. This is the biggest event in Cage Warriors history. Shore’s Welsh fanbase has grown even more formidable since his first-round TKO over Weslley Maia at the sold-out CW97 and is expected to turn out in force to witness the biggest fight of his life when he returns to Cardiff Bay on Saturday, December 8. Shore trains out of Blaenau, where his dad, Richard, owns and runs one of the biggest MMA gyms in Wales, and he is unbeaten after 12 amateur contests and nine professional fights. “I won British and European amateur titles and turned professional with Cage Warriors,” says Shore, who trains three or four times a day, six days a week. He played football and rugby in younger days, but has always had a liking for martial arts including kick boxing, tradition Japanese ju jitsu and Brazilian ju jitsu plus boxing and wrestling. Shore started fighting as an amateur at the age of 17 and turned pro four years later. I’m doing alright – 9 pro/12 amateur won all of them. British and Euro titles at amateur, turn pro with CW and been with them since second pro fight and going for World title. “Because of the way it’s set up the atmosphere was electric for my last fight. In the co-main, Aiden Lee and Dean Truman fight for the featherweight title previously held by former champions Conor McGregor and Paddy Pimblett. After battling their way to the title shot in Cage Warriors’ featherweight tournament just months ago, it’s time for Lee and Trueman to meet in the biggest moment of their careers to date. Elsewhere on the card, UFC vet and ex-CW champion Nicolas Dalby takes on Ireland’s Phil Mulpeter in the welterweight division, with both men fighting off the back of big finish wins earlier in the year. Expect two striking masterclasses in Alex Lohoré v Tim Barnett and Jai Herbert v Joe McColgan, and a potential pick for fight of the night when Håkon Foss takes on Welshman Aaron Khalid. 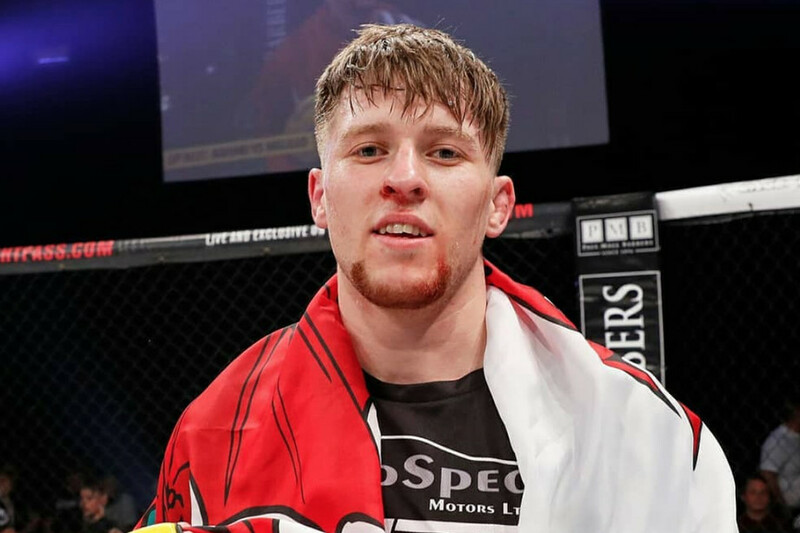 Top UK prospect Rhys McKee makes his Cage Warriors debut against Jefferson George in the lightweight division, and it’s Wales vs Scotland when former bantamweight title challenger Josh Reed meets Scott Malone. Before the CW100 pro card, the Cage Warriors Academy Grand Prix finals will see Europe’s top amateur talent compete for a pro contract, after fighting their way through the quarter and semi finals throughout 2018. It’s all to fight for. CW100 tickets are still available HERE. Doors at the Viola Arena open at 3pm. Spectators also have the opportunity to meet UFC legend Dan Hardy, former CW champs and now Welsh UFC names Brett Johns and Jack Marshman, plus CW Octagon Girl Edith Labelle at the CW100 meet and greet.